Official artworks of Lumas from Super Mario Galaxy. 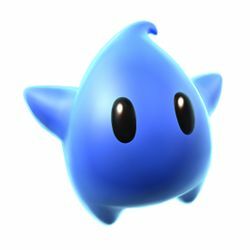 Lumas (チコ, Chiko) are a species of creature from the Mario series. They appear in a variety of colors, and possess a number of distinct abilities related to outer space, most notably the ability to transform into celestial bodies. The Lumas are commonly seen alongside Rosalina, who acts as their surrogate mother. Two different colored Lumas in their debut of Super Mario Galaxy. 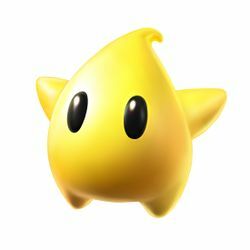 Lumas are star-like creatures that have appeared in central roles in both Super Mario Galaxy and Super Mario Galaxy 2. They are friendly creatures who have the ability to transform into several outer space-related objects, such as Launch Stars, planets, and even Galaxies. They can also grant abilities to others, such as the ability to shoot Star Bits or Spin. Not much is known about the Lumas' origin, although what is known is that upon death, they are reborn into new stars. They come in a variety of colors, including yellow, red, blue, green, apricot, dark brown, pink, purple, turquoise, and orange, while even giant varieties have also been seen. 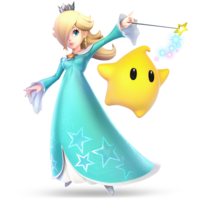 A Luma alongside Rosalina, as they appear in Super Smash Bros. 4. The Lumas fight alongside Rosalina as newcomers in Super Smash Bros. 4. 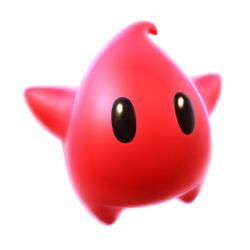 They function similarly to Pikmin in that they have a set amount of hit points, but can also fight on their own, similarly to the Ice Climbers. In addition to the yellow Lumas that always appear with Rosalina at the start of a battle, green, blue, red and apricot (the color of baby Luma) Lumas appear, as does Polari. However, Polari and these other varieties only potentially do so when the initial Luma is KO'd. Lumas do not have any trophies of them alone, although they share several trophies with Rosalina. 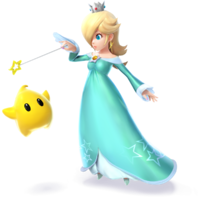 A Luma alongside Rosalina, as they appear in Super Smash Bros. Ultimate. Lumas reappear alongside Rosalina in Super Smash Bros. Ultimate. They have been nerfed during the transition, having more ending lag and less knockback on most of their moves. However, Lumas have also gained increased hit points and a 1.5× damage multiplier when launched away from Rosalina. Yellow Lumas can transform into Launch Stars and Sling Stars. Giant yellow Lumas also appear in Super Mario Galaxy 2. Blue Lumas can transform into Pull Stars. 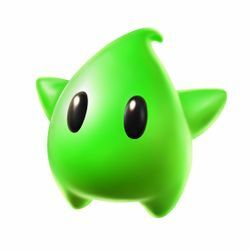 Green Lumas can be found on the Planet of Trials after finding the three Green Power Stars in Super Mario Galaxy. Red Lumas allow Mario to use the Red Star while on the Comet Observatory, and during one of the Purple Coin missions in Super Mario Galaxy. 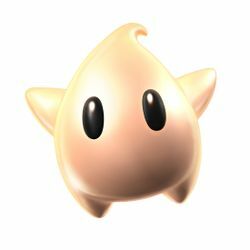 Baby Luma, who assists Mario by granting him the ability to spin, has a unique cream coloration. 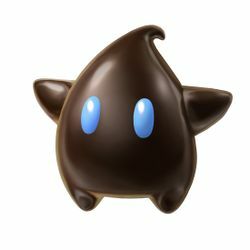 Polari, Rosalina's trusted advisor in Super Mario Galaxy, has a unique overall coloration of a blackish brown body and sky blue eyes. A tip confirms that Polari is indeed the blackish brown Luma that can appear alongside Rosalina. In Ultimate, if a Luma is KO'd and is launched, hits a ceiling then the ground again, it can still attack before it vanishes. This page was last edited on April 24, 2019, at 10:02.